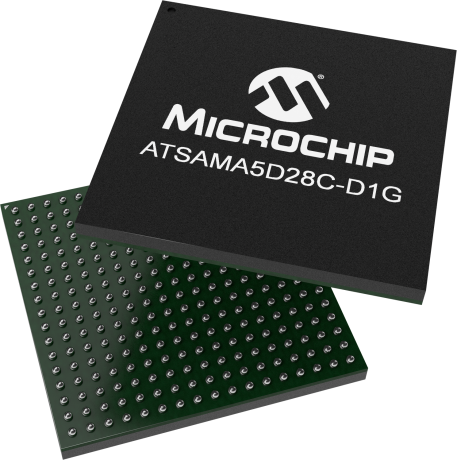 The SAMA5D28C-D1G System in Package (SiP) integrates the ARM® Cortex®-A5 processor-based SAMA5D28C MPU with 1 Gbit (128 Mbytes) of DDR2-SDRAM in a single package. By combining the high-performance, ultra-low-power SAMA5D2 with DDR2-SDRAM in a single package, PCB routing complexity, area and number of layers is reduced in the majority of cases. This makes board design easier and more robust by facilitating design for EMI, ESD and signal integrity. This SiP targets secure payment applications. The SAMA5D28 MPU has passed UL testing for PCI 5.0 pre-certification.